“We Were Beautiful Once” is a psychologically complex courtroom novel that builds an intriguing web of events, creating a sustained sense of anticipation from chapter to chapter in the mold of John Grisham’s The Pelican Brief, where trial lawyer Nick Castalano tries to uncover the fate of Roger Girardin, MIA during the Korean War, and discovers he may have been murdered in a POW camp by Trent Hamilton, a politician (sights on becoming governor) and businessman. Before the war, Jack O’Conner, Hamilton, Girardin and Julie, Girardin’s girlfriend and Jack’s sister, hung out. In part the story follows the lives of the survivors, who after the war, with Roger’s disappearance and Jack and Trent having spent years in a North Korean hell-hole, change dramatically, notably Jack goes through life teetering on the edge of insanity (believing he may have killed Girardin) and that his murderous act will be discovered by his sister, who waits her entire life for Roger’s return. Carvalko writes with such convincing realism and lyricism that I was at once brought into the landscape of his literary vision and grip of his storytelling. His prose is wiry and wise, steely yet soulful. His tales are tethered to real life, lived and thoroughly pondered. In right light, he is a cross between James Patterson and Scott Turow, only wiser and much more generous. — Da Chen, New York Times bestselling author of “Colors of the Mountain,” a memoir, “Brothers,” a novel, and “My Last Empress,” a novel. Joseph Carvalko is an American writer, lawyer born in Bridgeport, Connecticut. 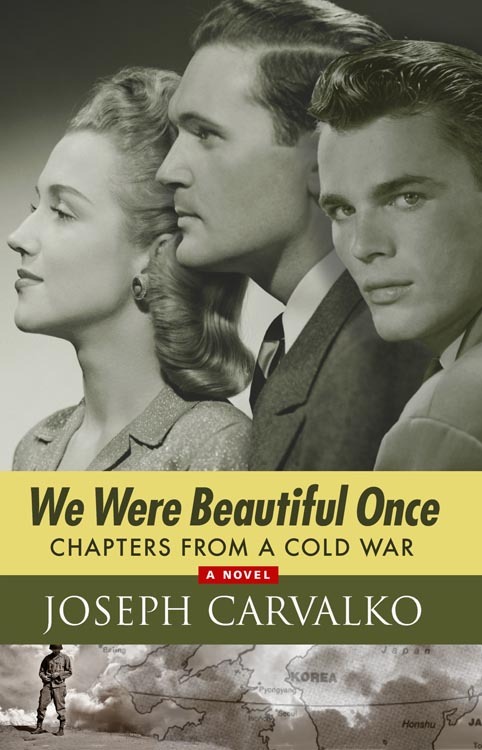 The novel, We Were Beautiful Once, Chapters from a Cold War was inspired by a case he tried in Federal Court to locate a Korean War POW. In addition to numerous professional and academic writing, other of his publications include: The Techno-Human Shell-A Jump in the Evolutionary Gap (2012), which details the rapid rise in cyborg-like technology; A Road Once Traveled, Life from All Sides (2007); and A Deadly Fog (2004). In 2012, he was one of two finalists for the 2012 Red Mountain Press Prize for Poetry, for The Interior, A Memoir; and one of three finalists for the 2012 Esurance Poetry prize, for his poem “The Road Home.” When he is not writing, he plays jazz piano. He, his wife Susie, and four cats live between the Connecticut and Florida coastal areas.